I love fall, it is my favorite time of the year. Instead of fall colors, I am surrounded by pink. Everywhere I look I see breast cancer paraphernalia being marketed and displayed. Companies look charitable. Social media is ablaze. The world is turning pink. I live pink. It is not just a Pinktober thing. 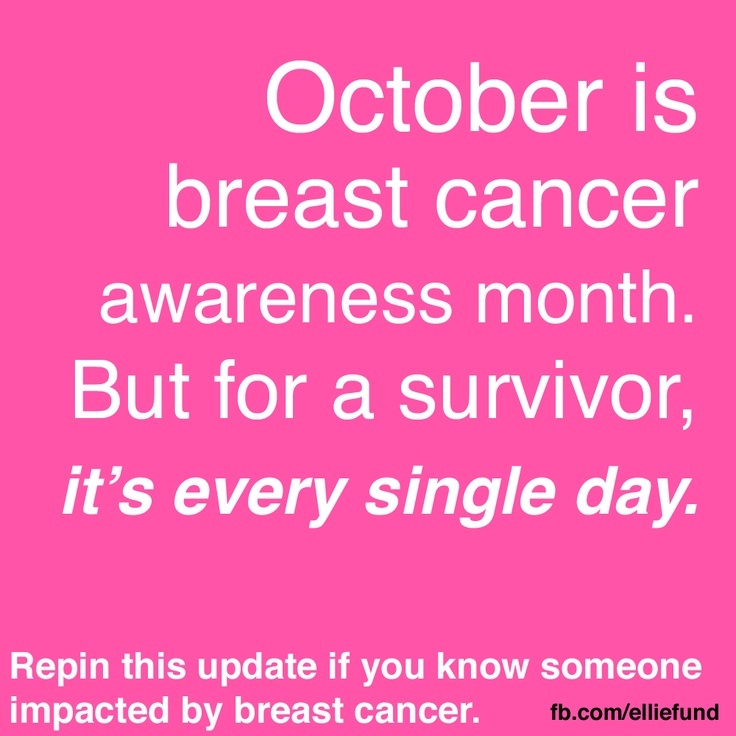 Breast cancer has infiltrated my life, it is here year round. Pinktober is a double-sided sword for me. On one side I am grateful to whatever it takes to get people motivated, involved, concerned, donating, caring, or active in the cancer community. Then there is the other side, the part that makes almost all breast cancer survivors cringe… the blatant misrepresentation and misuse of all things Pinktober. Ironically, the whole breast cancer awareness month was created by a drug company. October was labeled National Breast Cancer Awareness Month where pink ribbons and merchandise began being sold without any regard to education or awareness. Breast cancer activists, like the fighters we are, renamed it and began focusing the month on education and prevention. Of course, the month is still about being pink and selling pink items! Most people want to help and feel like they are purchasing a product where the funds can go towards breast cancer. However, there are things to consider before buying that pretty Pinktober item sitting in the window. Any company can put a pink ribbon on a product, as it is not regulated. Basically, I can put pink ribbons on any product without having any connection to breast cancer. In fact, some companies intentionally include pink ribbons on products and have no specific contribution policy towards the purchase of the product in hopes to mismarket to buyers. So, be careful not all pink is charitable. We donate to breast cancer... or are you? Companies will say that they donate a percentage of the sale of items to various programs or organizations - and they may actually be donating money. But if they are donating a small percentage of a purchase, then it may take an obscene amount of purchases to just equal a few dollars. It is usually better to donate directly to a breast cancer charity. How much does the company give? Some companies place a “cap” on how much they will give from the sale proceeds of a particular pink campaign. If the cap amount is met, then the company can keep selling the product - keeping all of the proceeds to itself. The company is not obligated to donate any money over the cap amount to the cancer charity. The company does not have to tell the consumer anything. Basically… money can easily go to the company’s bottom line and not to breast cancer. The money is for breast cancer... or is it? As consumers we trust that the organization receiving donated funds will use that money towards the greater good. The money that we are donating is effective. One of the biggest issues to consider is how is the donated money being used? Is it for prevention screenings, education, research, or any of the many other ways the organization could choose to use the money? The money may not be used to address some of the biggest current issues facing breast cancer like metastatic breast cancer research, social inequities leading to breast cancer death, and identifying toxins that contribute to higher rates of breast cancer. Who are you giving too? Before donating, review the breast cancer organization’s mission which can be found on its website. It is a good way to determine if you would want your money to be donated to that organization. Otherwise, you might want to re-examine your purchase or look to donate directly to an organization that you do support. Not all pink is pink friendly! Some pink products being marketed are known to increase breast cancer risk. No joke. Companies selling products that have toxins or possible chemicals known for increased risk for breast cancer have marketed those products pink. Cosmetics, perfumes, car emissions, and others have all been linked to breast cancer and gone pink for the month of October. Not all pink is friendly. Funding for breast cancer research? All this pink… and it's making all this green. A lot of money is going toward breast cancer research, or is it? Breast cancer research is a multibillion-dollar per year industry. The major players are the National Cancer Institute (NCI), which spent $572.4 million+, the National Institutes of Health (NIH) which spent $705 million+, and Komen for the Cure Foundation which spent $162 million. There are also many other companies experimenting with innovative techniques and pursuing treatments, drugs, and devices for breast cancer. Less than 5% of all money being spent on breast cancer is towards metastatic breast cancer… which is shocking! That is a lot of money and there are a lot of companies focused on breast cancer research. In theory it sounds amazing. However, all those funds and companies do not coordinate. The research is not shared or explored. Essentially research could be being reproduced, re-done, or unexplored. Just think on that for a few minutes before you read on… think of all the things they are missing out on and the possibilities lost. The double-sided pink sword! The double-sided pink sword is constantly in my mind and heart in October. As the commercials show pink products, I am happy that companies are giving, but I am unhappy that they cover up the small percentages and “caps” - so it is really not enough. I am thrilled for the publicity and fundraising, but I am unhappy to see products contributing to increasing risks to breast cancer being sold under the guise of a breast cancer supporter. I am thrilled that companies, communities, and people are involved and fostering relationships that would help fund breast cancer organizations. Yet, I am disappointed that the funds are not always properly distributed or allocated to support the true needs of people with breast cancer. Knowledge is power, so it is important to share the myth of Pinktober. Pinktober is for one month. 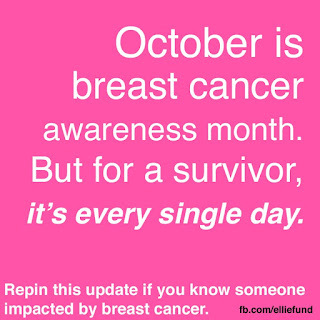 It makes me happy to know that for one month the world will be focused on breast cancer. Yet, it is also a month where pink is inundated on every product and my journey becomes more of a marketing ploy than a truth for other people. Unfortunately, we now need Pinktober awareness about the mismarketing of all things breast cancer pink.